are sold The cover of this book depicts a broth in which asparagus tips float with slivers of edible green peas, spinach leaves and violet chive blossoms – the colors and flavors of spring. Soups aren’t just for winter, although we love them especially well then, but for all times of the year. Regardless of the season, soups comfort and also invigorate us. They are imbued with nourishing powers and plenty of visual charm. I always think of both pottery and food as coming from the earth, so it seems natural to consider the dish as much as – in this case – the soup that goes in it. I’ve always been drawn to folk art ceramics for their beauty and they way they set off foods of all kinds. I have featured traditional folk art ceramics in all my books. But in Vegetable Soups, which portrays the vessel as well as its content, you’ll find some extraordinary ceramics made by contemporary American potters as well as some more traditional pieces. Both show off soups with extraordinary clarity. 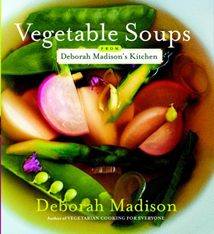 Vegetable Soups from Deborah Madison’s Kitchen was an IACP Cookbook Finalist and a James Beard Cookbook Award Nominee.